Not a recipe this one. Just a bit of a thank you, really. I’ve been writing this blog for a year now, and it makes me really happy. As much as anything it’s a great way for me to keep my recipes, but I do enjoy sharing my baking and this way I get to share it with all of you who read it. Along the way, even before I started, there’ve been some people who’ve been super supportive and encouraging. I want to say a little thank you to a few. They’re all lovely folk, and you could do worse than follow them (on Twitter) or check out their blogs. Firstly, The Ginger Bread Lad, one of my favourite baking bloggers, who was always so nice about my baking on Twitter and suggested I give blogging a go. Definitely one to watch, this one – I expect big things from him in the future. Have a look at his recipes here. Then there’s Alice. Lovely Alice. Encouraging me to blog doesn’t really cover it. Nagged. Pestered. Bullied. Even came round my house and helped me get it working properly and gave me a 101 in WordPress. If you’re lucky enough to know Alice (and if you live in Brighton, I’d be surprised if you don’t, networking queen that she is), then her generosity of spirit knows no bounds. She’s also a good excuse for me to come up with more gluten-free baking. Check out her Gluten-Free Dining Guide. The delightful Arusha Elworthy lent her magnificent skills by creating my logo. I particularly love my little pink-haired, leopard-aproned baker (me in cartoon form, even though my hair is no longer pink). Thank you for making me look so adorable! 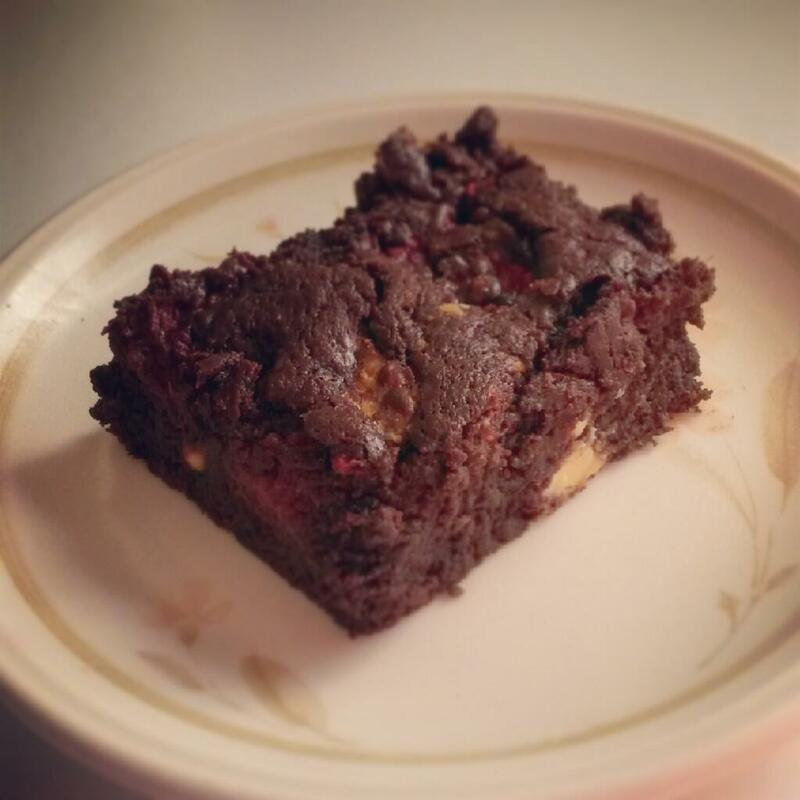 My most unusual recipe to date has to be my Gluten-Free Bacon and Peanut Butter Brownies, created for the Pork Princess herself, Nicole ‘Snafflepuss’ Healing. She was even kind enough to re-blog my recipe on her blog, where you can find plenty of good stuff to read about all sorts of things. She’s also a marvellous yoga buddy. Speaking of buddies, Hannah is my good Bake Club buddy. And she’s a dab hand with the old crochet hook, crafty mare, and made me the most amazing birthday present of some beautiful pink lips and a cake, which I proudly wear daily and get lots of compliments on. That’s them in the picture below. See how clever she is?! 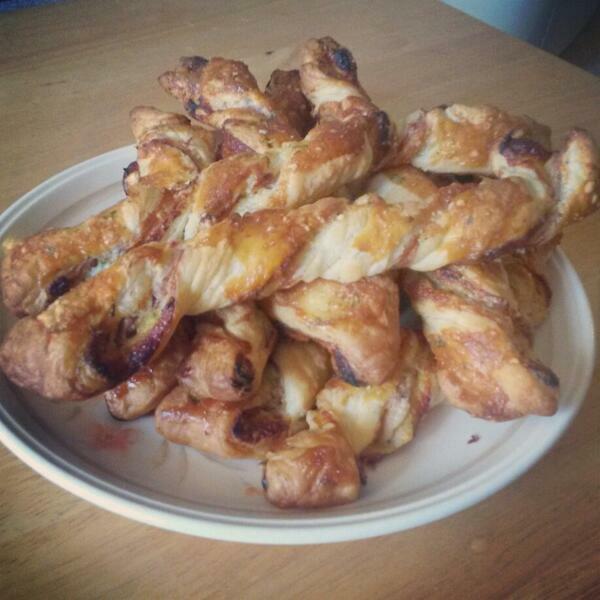 Oh, and she guest-blogged some tasty little biscuits. Endless encouragement and offers of help come from my favourite glamour-nerd on the street, Amy Blackburn. I’ve known and loved her long time, and I’m inspired and delighted by her success setting up her own business. If you like geeky, comic book stuff and super cute clothes then Geek La Chic is the place for you. A few friends in Twitter-land, who I hope one day to meet for real, also deserve mentions for all their retweets, confidence boosting and even trying out my recipes. Thank you Faye, Dodie, Mike, Jacquie (perhaps better known as Bite Me Brighton) and Julie – you’re all awesome and deserve a huge slice of cake. 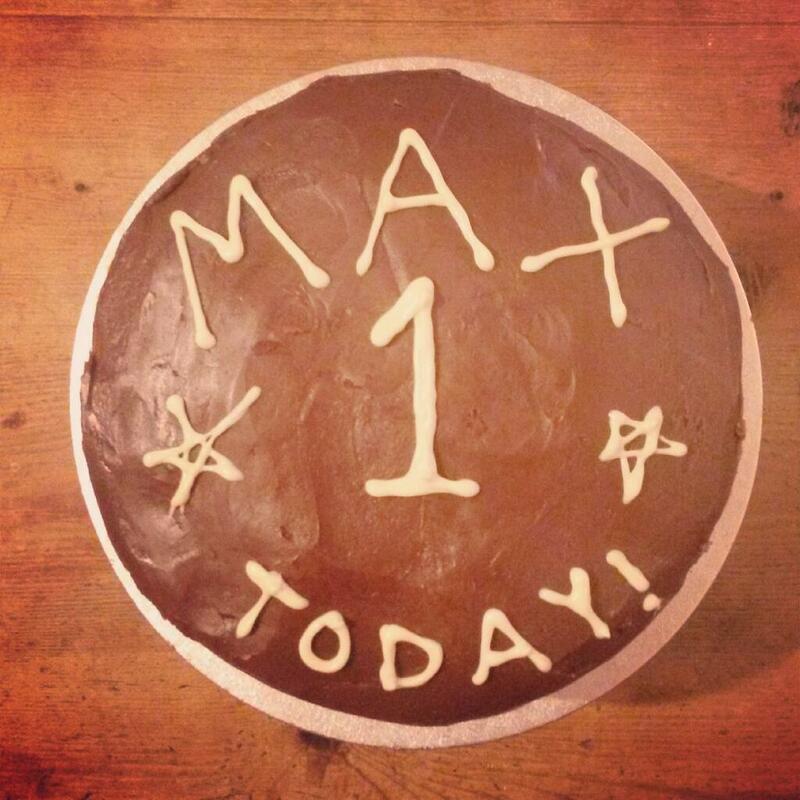 Whilst there’s no recipe this time, I did make myself a big old blog birthday cake. I would have blogged it, but honestly, though it looks pretty good in the picture there were a few disasters with this along the way. 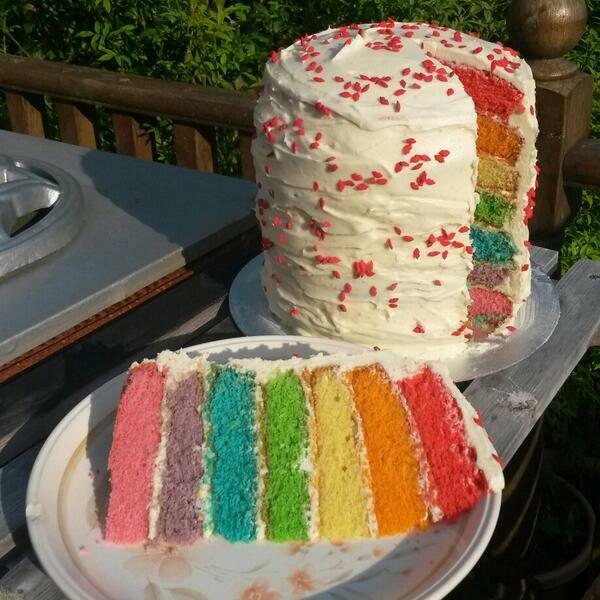 You’re bound to find a decent recipe for rainbow cake online, and I know that Holiday Baker Man is kindly willing to share his expertise if you are brave enough to give one of these mammoth cakes a go. Still, for all its issues, it didn’t half look impressive when I cut a slice! There are plenty more people I probably should have thanked (ooh it’s all gone a bit awards ceremony speech), but I don’t want to run the risk of boring anyone so much they never come back to look at my recipes. So to all of you who’ve ever read my little blog – thank you! 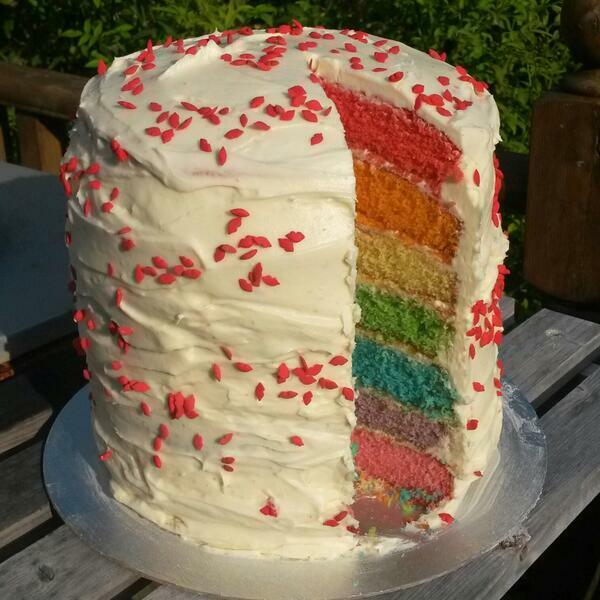 Posted in Uncategorized and tagged birthday, birthday cake, cake, rainbow, rainbow cake. Bookmark the permalink. 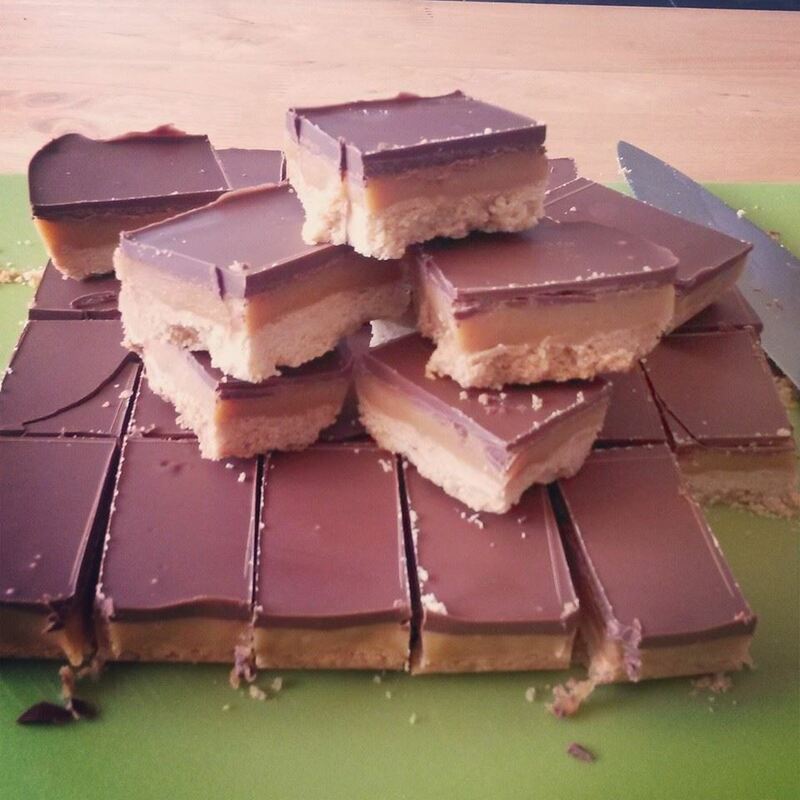 Peanut Butter Salted Caramel Millionaire’s Shortbread, a pimped up version of a classic. My friend Tora and I have been making salted caramel millionaire’s shortbread for years – both of us are obsessed with salted caramel. But then I thought, there’s not many things in life that aren’t improved by a little peanut butter. So I did this. And it was good. You can easily omit the salt from the caramel if you want as the peanut butter will most likely be a bit salty anyway. But if you are using it, always add your salt last and in tiny amounts, tasting as you go. You can always add more, but you can’t take it away if you add too much! This is pretty rich, so I definitely suggest cutting it into small portions. Heat the oven to 180C and grease and line a tin (approximately 25x20cm) with greaseproof paper. In a large bowl, cream together the butter, peanut butter, vanilla and sugar. You can use an electric whisk for this but if your butter is nice and soft then it won’t take much work with a wooden spoon. Once well mixed, add the flour and rub it in with your finger tips until it’s the consistency of bread crumbs. Tip the mixture into your lined tin and squash and press it down and into the edges of the pan until you have an even layer – use your knuckles or the bag of a large spoon. Prick it all over with a fork and put it in the oven. Bake at 180C for 5 minutes, then turn down to 150C and bake for a further 30-35 minutes until evenly golden brown. Remove from the oven and cool a little before you’re ready to apply the caramel. You can make the caramel whilst the shortbread is in the oven. In a medium sized heavy bottomed saucepan, melt the butter over a medium heat. Once the butter is melted add the condensed milk and golden syrup and continue to heat, stirring all the time with a wooden spoon. Seriously, don’t be tempted to leave this and do something else – the high sugar content means that it can easily catch and burn – I’ve made that mistake in the past and it’s frustrating and a waste when you have to chuck a batch of burnt caramel away, not to mention the mess it makes of the pan. Cook for about 10-15 minutes, hot enough to boil but not vigorously, and be careful as you don’t want to get splashed with it as it’s super hot. The caramel is ready when it’s, well, caramel coloured. Remove from the heat and stir in the peanut butter. Before adding any salt, taste a little bit (blow on it first and be very careful not to burn your tongue). Add the salt a pinch at a time, tasting after each addition. Once you’re happy with it, pour it over the cooked and slightly cooled shortbread. Spread it out with a spatula until it’s reached the edges and you have an even layer. Leave it to cool, or even put it in the fridge to set up a bit before you add the final layer of chocolate. (To be honest, it won’t matter if you just use milk chocolate, but I prefer a mix of milk and dark) Melt the chocolate, either in a bowl over a pan of simmering water, or in short, 20 second bursts in the microwave, stirring in between zaps. Once melted, pour over the shortbread and spread it to the edges. Give it a shake and a sharp rap on the kitchen counter to get a nice even finish. Leave to set in the fridge for at least a couple of hours. Remove from the pan, peel off the greaseproof paper and use a big sharp knife to cut into portions (I got 32 pieces out of this). This should keep well for 3-5 days in an airtight container, but I doubt it’ll last that long once anybody tries it! If you’re as big a fan of salted caramel as I am, check out my other recipes here. 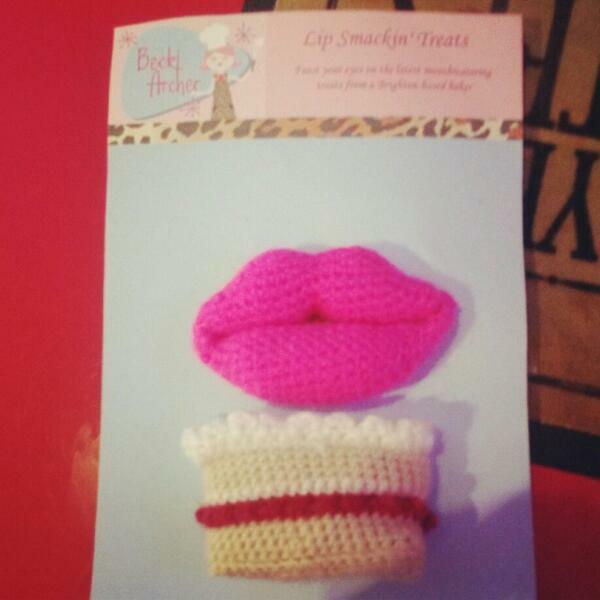 Or if it’s peanut butter that floats your boat, have a peek at these. Posted in Biscuits, Chocolate Bakes, Tray Bakes and tagged biscuits, caramel, chocolate, millionaire's shortbread, peanut butter, salted caramel, shortbread. Bookmark the permalink. 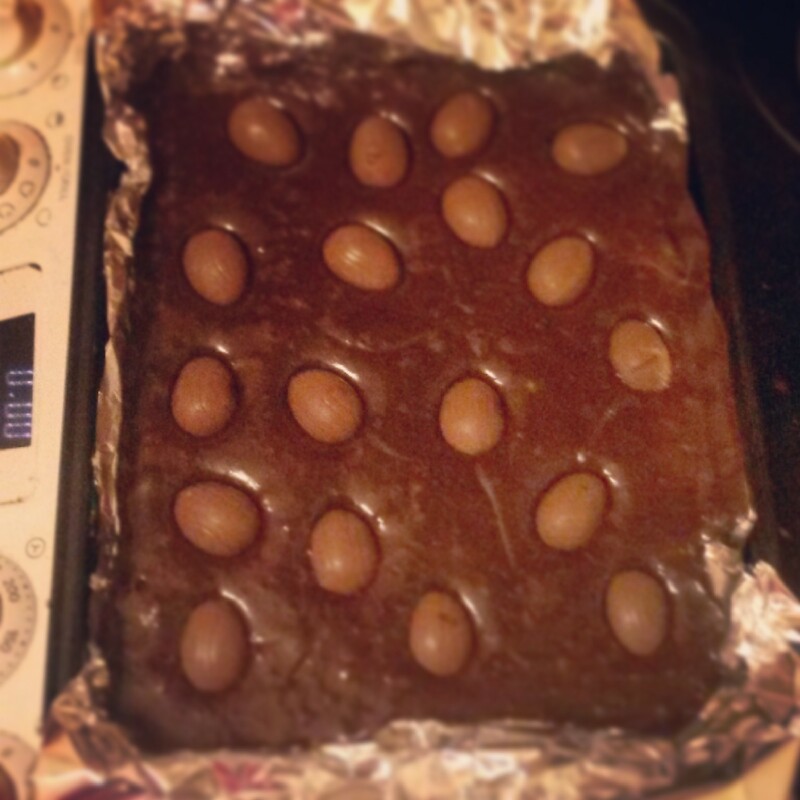 Choc full of chocolate and Cadbury’s mini Crème Eggs, my brilliant brownies. I know it’s not that long ago I posted a brownie recipe, but these are an awesome Easter treat so with a week to go until the day when it’s socially acceptable to eat chocolate for breakfast, I thought I’d share. You could easily leave out the mini Creme Eggs when they disappear from our shelves for another year – the brownie itself is spectacular, with most people I’ve given them to agreeing they’re the best they’ve tried. Heat the oven to 180C and line a tin approx 25x20cm with tin foil or baking paper. In a saucepan over a low heat, melt the butter until just liquid (you’re not aiming to colour the butter at all. Remove from the heat and stir through the chocolate until melted and combined with the butter. In a large bowl. or bowl of your stand mixer if you have one, whisk together the eggs and sugars until increased in volume and a sort of creamy brown colour. Fold in the flour and sugar, making sure you don’t leave any pockets of dry ingredients unmixed. Then pour and scrape in the chocolate and butter mixture and fold this through until you’ve achieved an even colour. 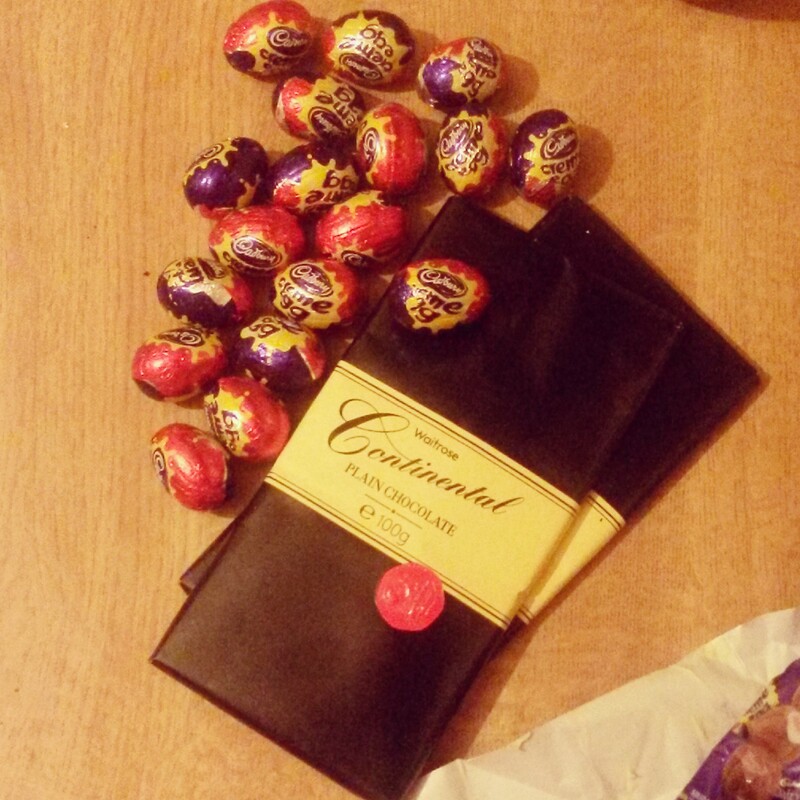 Pour into your prepared tin, then stud with the mini Creme Eggs, pushing them in just a little. Bake in the oven for 25 minutes. MORE CHOCOLATE! Make your brownies even more indulgent with the addition of Cadbury’s mini Crème Eggs! The brownie will form a crust that will probably begin to crack, but you can’t test if they’re done the way you do with a cake as the whole point of a good brownie is to be moist, sticky and sodden inside, so don’t be tempted to bake them longer. Remove from the oven and cool completely before cutting into pieces. A small piece of this rich, gooey brownie should be enough to keep any chocoholic in a state of bliss! For more brownie recipes click here. Or change things up a little and check out my blondies. Posted in Chocolate Bakes, Tray Bakes, Uncategorized and tagged brownies, Cadbury's, Cadbury's mini Creme Eggs, chocolate, Creme Eggs, easter, easter eggs, eggs. Bookmark the permalink. I’ve not blogged for a while, but it’s not for lack of baking, just lots of other things going on that have kept me from the keyboard. Hopefully I’ll be able to get lots of recipes added in a short space of time to make up for it. 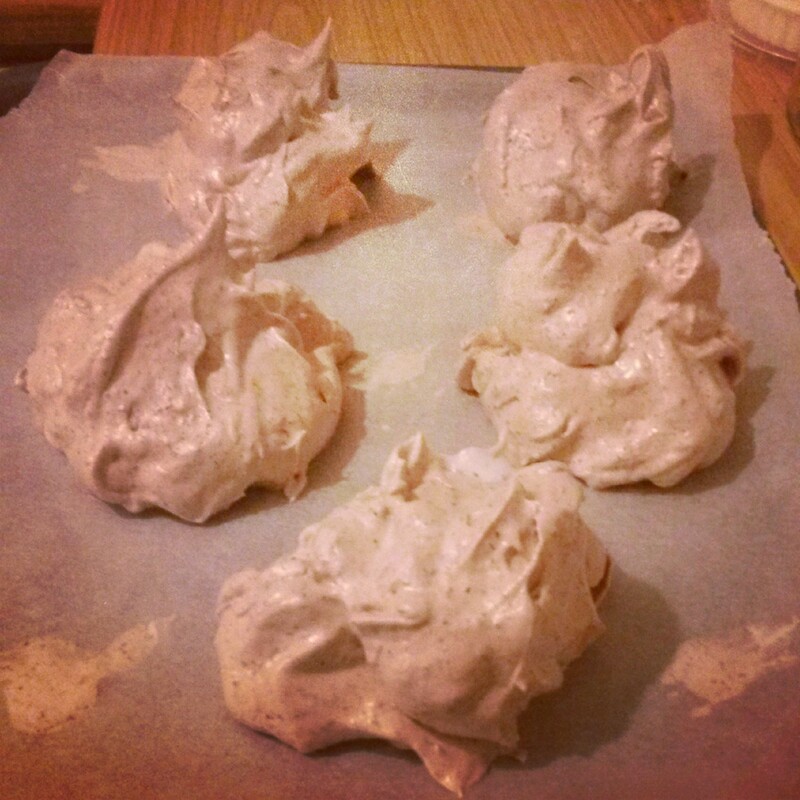 To kick things off, here are some lovely meringues I made when I was cooking dinner for friends recently. I served them with good vanilla ice cream, warm mixed berries (just a bag of frozen ones from the supermarket, heated through with a couple of tablespoons of sugar), salted caramel sauce and chocolate hazelnut sauce. Meringues are great for entertaining as you can make them several days in advance and (once cooled) store them in an air tight container or tin. Heat the oven to 180C and line two baking trays with greaseproof paper (when the meringue is made, used little blobs of it to secure the paper to the baking trays). Using a stand mixer or electric hand whisk, whisk the egg whites until you get to the stiff peak stage. Still whisking, add the sugar a tablespoon at a time, allowing the sugar to get completely incorporated before adding more. Continue to whisk until all the sugar is mixed in and the meringue is white and glossy. Add the cocoa and dark chocolate, folding in with either a rubber spatula or large metal spoon. DO NOT use a wooden spoon or other blunt kitchen tool as you’ll lose too much of the air you’ve spent so long adding. You can be quite swift and firm when folding in, but make sure you don’t leave any pockets of dry ingredient unmixed. Sprinkle over the cornflour, vinegar and toasted almonds and fold these through. Dollop mounds on the prepared baking sheets, leaving a little space between as they will spread and settle a little. Place the meringues in the oven and turn the temperature down immediately to 150C. Bake for 45-50 minutes. 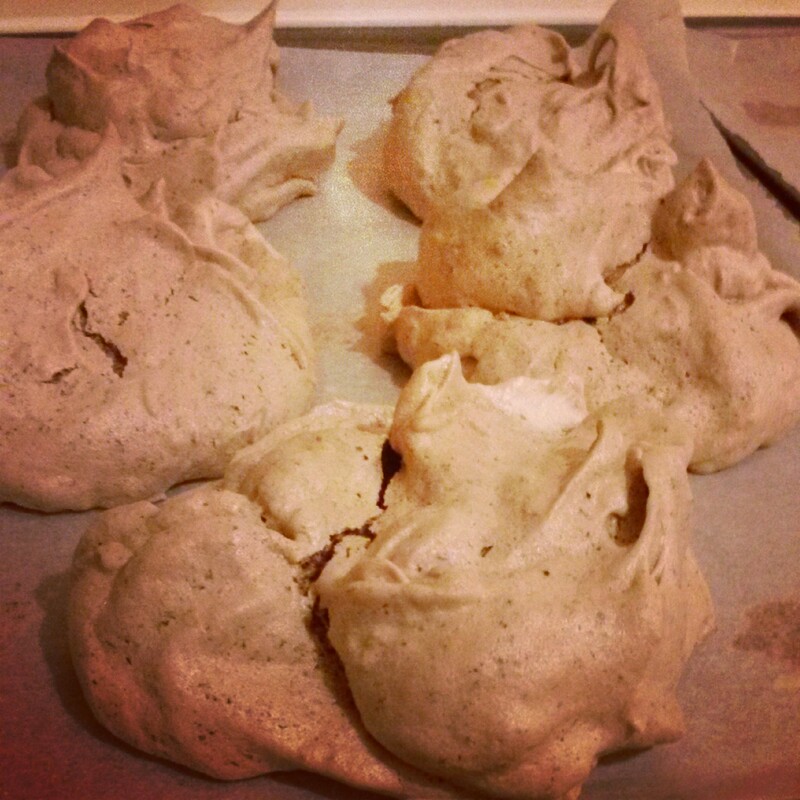 The meringues will be crisp on the outside, possibly even a little cracked, with a chewy, marshmallowy middle. Remove from the oven and allow to cool and use the same day, or you can store them in an airtight (and completely dry) container for 3 or 4 days. To make an easy chocolate sauce, heat 300ml double cream to just below boiling, break in 150g milk chocolate (or a mix of milk and plain) and stir until melted. Add a tiny pinch of salt and, if you have it, a tablespoon or two of liqueur (I used hazelnut, but orange, mint, brandy or Baileys would all be perfect). Allow to cool to room temperature. Pour over almost anything for instant deliciousness! If you want to make your own salted caramel sauce, I swear by Nigella Lawson’s recipe and you can find it here. 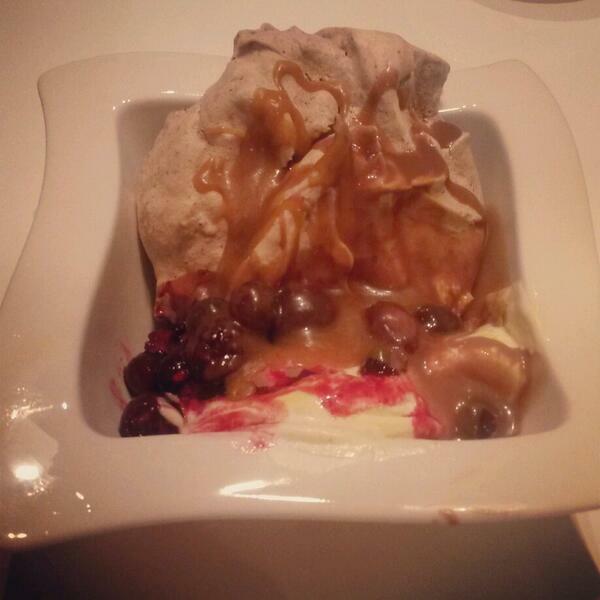 And if you want more meringue goodness, take a look at my other recipes. Posted in Chocolate Bakes, Gluten-Free Bakes, Meringue, Puddings, Uncategorized and tagged almond, almonds, chocolate, chocolate sauce, dessert, flaked almonds, meringue, salted caramel. Bookmark the permalink. Brownies, filled with love (well, raspberries and chocolate)! I’m not a fan of Valentine’s Day, but I’m not really traditionally romantic. I don’t like flowers all that much, I don’t particularly like having stuff bought for me and the idea of being ‘spoiled’ is something I can’t get my head round – after all, something that’s spoiled is a bad thing, right? The most ‘romantic’ things that have ever been done for me, gestures filled with emotion at a time when I really needed to feel loved and cherished in some way, have all been done for me by friends. I don’t think you should need a special day to show somebody that you love them, or if you do want to show somebody how much they mean to you I don’t think that person needs to be a romantic partner. I mostly show people how much they mean to me with food – cooking their favourite meal, baking something using their favourite ingredient or making dinners they can chuck in their freezer to use when their time is needed for something more important than cooking. If you did want to show somebody how much you care, I think these brownies are a pretty good place to start. Heat your oven to 180C and line a tin (approx 25x20cm) with foil (leave it hanging out of the tin a bit as you’ll be able to use it to lift the brownie out once cooled). In a medium sized saucepan, gently melt the butter until liquid but not browned. Turn off the heat and add the chopped dark chocolate, stirring until melted. Add the sugars and continue to stir until well combined. Next add the flour, sifted cocoa and baking powder and mix well so that no patches of dry ingredients remain. Crack the eggs into a mug or bowl and lightly beat them before pouring into the chocolate mix and giving the whole thing a big stir so it’s all well combined and glossy. Pour the brownie mixture into the prepared tin and spread it out evenly so it’s right in the corners. Scatter the raspberries over the surface, followed by the white chocolate chunks. Use a teaspoon to sort of nudge the raspberries and chocolate into the brownie mix so that they’re nestled and smothered into the raw brownie mix. I suppose you could just add the fruit and chocolate to the brownie mix before you pour it into the tin, but by doing it this way you should avoid everything just sinking to the bottom as it cooks. Bake in the oven for 25-35 minutes – the brownies are done when the top is set and firm but a skewer inserted still has a little gunge clinging to it – brownies should always have a bit of goo to them even when cooled, and the abundance of fruit in these helps them stay incredibly moist. Remove from the oven and allow to cool completely in the tin, before lifting out and cutting into squares. OR you could serve them, still a little warm, with some pouring cream or ice cream as a lush dessert to end a special meal. 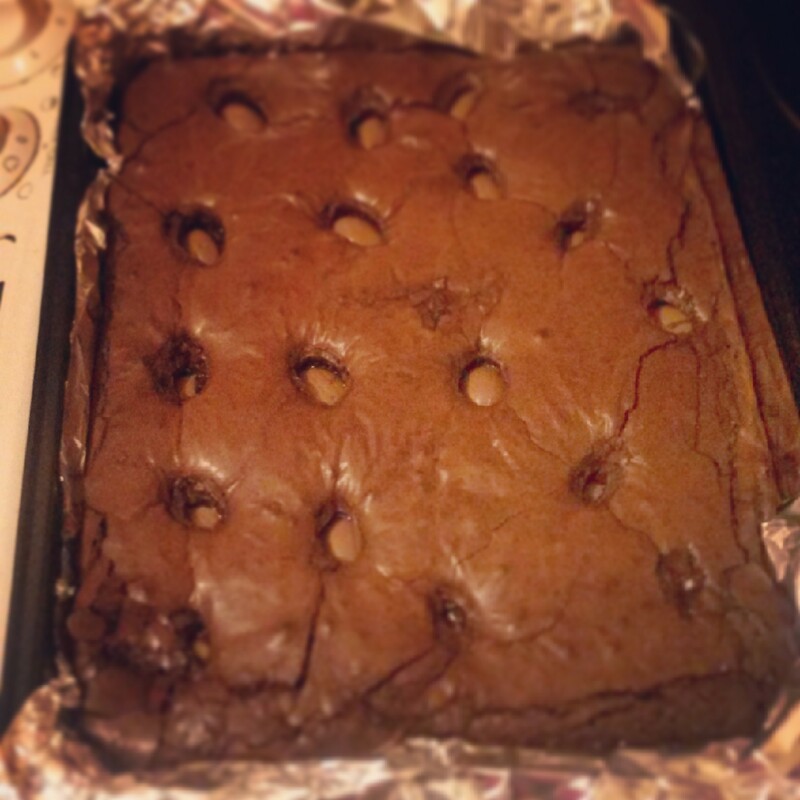 For a very different kind of brownie recipe click here. Or perhaps white chocolate in my blondies might tickle your fancy. Posted in Chocolate Bakes, Fruity Bakes, Tray Bakes and tagged brownies, chocolate, raspberry, white chocolate. Bookmark the permalink. Judging by how many birthday cakes I’ve been asked to make in the last few weeks, spring really does get everyone’s sap rising! Anyway, the lovely Natasha Bailie (parental types should check out her blog, the milkstand) asked me to make a cake in honour of her baby boy’s first birthday. The babies attending Max’s birthday party will be having something a little kinder to young tummies and teeth, but the grown ups are getting the big-fat-birthday-cake experience with this totally chocolaty bad boy. The instructions for making the ganache are given last as covering the cake with this divine mixture is the last stage of the cake. However, as the ganache needs to cool before using, it’s actually a good idea to make it first, or around the same time as you make the sponge. Heat the oven to 175C and grease and line 2 8″ cake tins with greaseproof paper. In a large bowl, cream together the butter and sugar until light and fluffy. Beat in two of the eggs until well mixed and smooth. Add the cocoa and a bit of the flour and mix again, scraping down the sides of the bowl to make sure everything is being well incorporated. Beat in the third and fourth egg, then the remaining flour and baking powder, then the vanilla and syrup, and finally slowly add the milk, mixing until you get a soft batter that drops easily off a spoon. Divide the mixture as evenly as possible between the two prepared tins, flattening it out with a spatula. Bake for 25 – 30 minutes – the cake is done when the middle springs back when lightly pressed with your finger, a skewer comes out clean and it’s beginning to come away from the sides of the tin. Remove from the oven and cool on a wire rack. Once completely cool, remove the greaseproof paper and cut in half with a large, serrated (bread) knife. You now have your four layers ready for filling and covering! If you have a free standing mixer or electric hand whisk, I’d suggest using it for this. In a large bowl, beat together the butter, sugar and vanilla (start slowly to try and avoid covering your kitchen in icing sugar). Beat for longer than you think you need to – this way you’ll get a lovely soft, lightly whipped textured buttercream. Melt the white chocolate (either in a bowl set over a pan of simmering water, or very carefully in a microwave in bursts of 20 seconds, stirring in between). Allow the chocolate to cool a little before adding to the buttercream and give it a really good beating to make sure it’s well mixed. Place one of your layers of cake on a cake board or whatever serving plate you’re planning on using. Dollop about a third of the buttercream on and use a palatte knife to spread it out to the edges in an even layer. Add another layer of cake, taking a little time to make sure it’s on straight and pressing down lightly to secure it. Repeat the process with the buttercream and cake layers until you have all four layers of cake sandwiched together with three generous layers of buttercream. Warm the cream in a medium sized saucepan until just under boiling point, a few small bubbles at the edge of the pan are fine. Turn off the heat. Add the chopped chocolate and stir into the cream with a spatula until completely smooth and no lumps of chocolate remain. Add the vanilla and a very small amount of salt (sea salt for preference over table salt) and mix well. Allow to cool completely, stirring occasionally. The mixture will become thick, but spreadable. Dollop most of the mixture on the top of the cake, then use a spatula or large palatte knife to smooth it out to the edges and down over the sides (this video will show you how far better than I can explain it!). If you want a really shiny finish, dip your metal palatte knife in hot water, dry it on paper towel and use the hot knife to smooth the surface of the ganache. Decorate however you wish – I melted a little white chocolate and piped the birthday boy’s name and age, but be as creative and flamboyant as you feel befits whoever the cake is for! 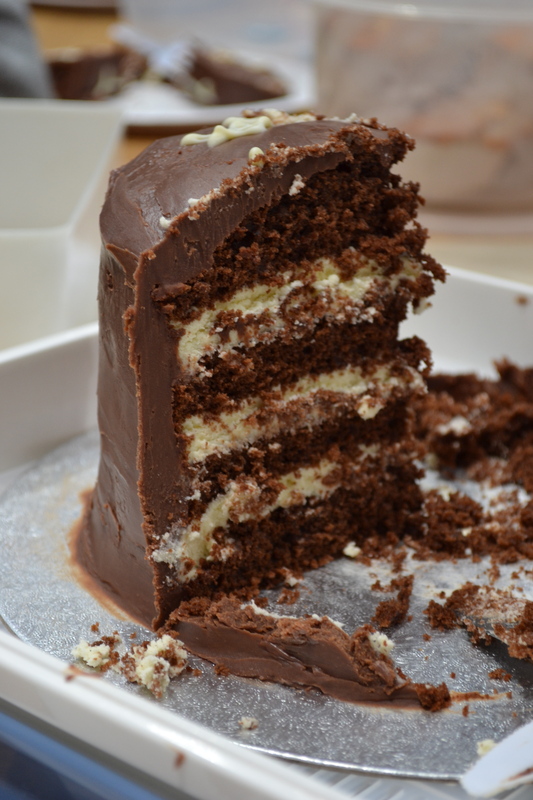 Chocolate makes the perfect birthday cake, whatever age! I have plenty of cake recipes that would all make wonderful birthday cake, click here to check them out. Posted in Cakes, Chocolate Bakes and tagged birthday, birthday cake, buttercream, cake, chocolate, ganache, milk chocolate, sponge, white chocolate, white chocolate buttercream. Bookmark the permalink.